Mouse to hit the ball. When using Major league players it is pretty easy to hit the ball when swinging slower. Remember that the total score counts, hitting 200 feet 3 times is more than just hitting one 500 foot home run. You can start your mouse movement below and outside the main game window if it helps you pick up more speed. Speed at the moment of impact is what counts so what counts is how quickly you move from player's feet to above his head. The rest is just follow through. White arrow shows which area of the bot should make contact with the ball for best results. If you hit with the area left from the arrow ball will 90 towards the left field and the opposite is true for the right area of the bat. Players ore easier to use. Simply place mouse cursor next to player's feet and when a pitch is thrown quickly move mouse upwards to swing. How far you hit will depend on how fast you are moving when contact is made with the ball and which part of the bat made contact with the ball. For best results middle of the bat head should hit the ball. You can use arrow keys to move batter to the left or right. Players are harder to control, but are more powerful and you have full control of the swing. Player will closely follow your cursor movements; up and down to swing, left and right for lateral positioning. When a pitch comes try to swing as fast as possible while still under control. 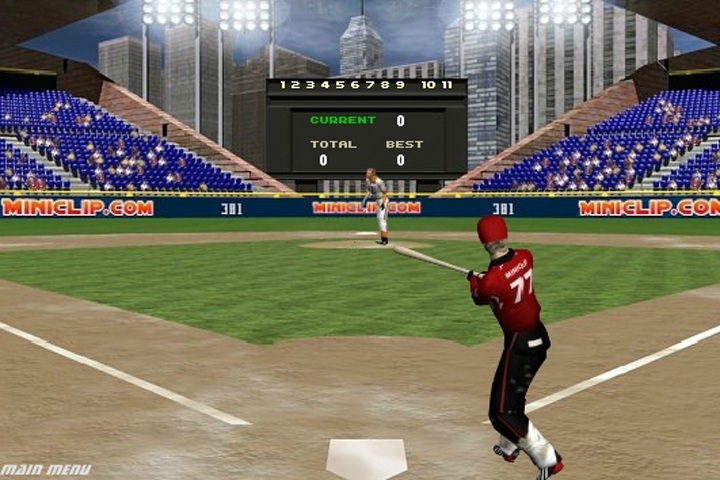 If you want to play Batting Champ games online you have come to the right place! GamesLoon adds new Batting Champ games every week. This is your game portal where you can find the biggest collection of free Batting Champ games online. Do not forget to rate our Batting Champ free online games while playing!